Openning reception: Friday March 30, 2012 from 6PM to 9PM. My first major juried show, Box 11 went really great. I got to meet so many wonderful artists and learned so much from them. Art lovers and audiances have also been really nice to me and I sold out all of the works on the first evening of the show. Tons of thanks to everybody who is hosting my art works in their home! Your praise has been a great source of motivation. My friend Darin White has covered the event on his photo blog and you can find it here, here and here. Kudos to the organizers of the show for such a wonderful work! 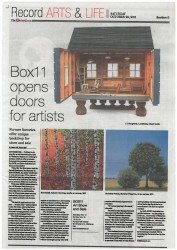 One of my paintings, "Autumn Morning" appears in "The Record" of October 29, 2011 along with works of fellow artists. The main article is about the Box Art Show and Sale which will be at the Rumple Felt factory, Kitchener on Nov. 12 and 13, 2011.